In fact this has been the case since when, in the early nineties, the band featured a self-portrait of Dalì melting on the cover of their debut of electronic narcosis. Also, it is said that Ozzy Osborne considered them to be the closest band to the original essence of Black Sabbath. But the praise was not enough to contain the ambitions of a band that wanted to make longer and more expansive tracks, inviting the listener to dive into a druggy, electrified spiral of sound. An ambition that eventually culminated in Dopesmoker, the most colossal doom metal joint ever rolled: an album of only one track of over an hour, considered unmarketable by their record label and not released in its original full glory until much later. 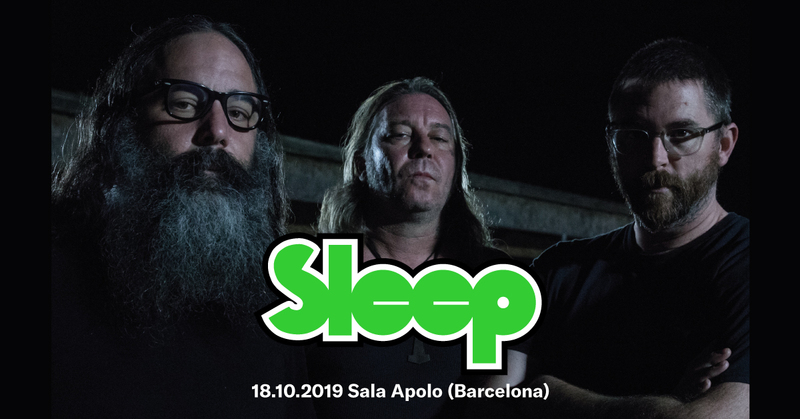 The members of Sleep had to split and go their separate ways –Cisneros slowing down even more with Om; Pike blazing his way with High on Fire– to end up being considered the flag bearers of their genre. When the beast awoke again, in a new incarnation, which has welcomed Neurosis drummer Jason Roeder to its ranks, we were ready to give it the welcome it deserved, as was Jack White. He opened his house to them on Third Man Records to release their comeback album, and to record Live at Third Man Records, an album with no curfew, released as a quadruple vinyl. The quicklime contained in those grooves give an idea of the power that this trio will display in the Apolo on Friday 18th October, in what will be their first visit to the city since their memorable performance at Primavera Sound 2017.